Abstract: The control of automated container terminals is complex since quay cranes (QCs), automated guided vehicles (AGVs) and automated stacking cranes (ASCs) interact for transporting containers, whereas collision avoidance of equipment must be considered. 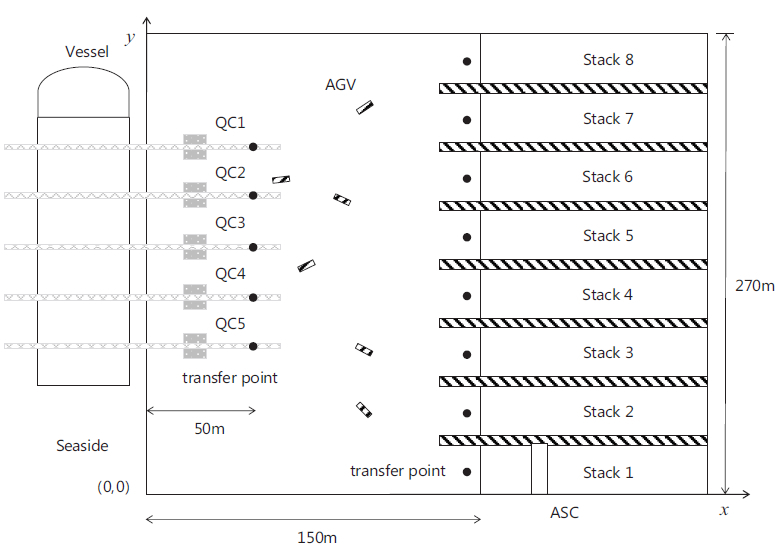 This paper proposes a methodology to generate collision-free trajectories of AGVs in automated container terminals, while minimizing the makespan of the whole container handling system. A hierarchical control architecture is proposed to integrate the scheduling of interacting machines and trajectory planning of AGVs. Following the job sequence of equipment given by a scheduler, the collision-free trajectories of AGVs are determined by solving a collection of mixed integer linear programming problems sequentially. Simulation results illustrate the potential of the proposed methodology. Reference: J. Xin, R.R. Negenborn, F. Corman, G. Lodewijks. Control of interacting machines in automated container terminals using a sequential planning approach for collision avoidance. Transportation Research Part C, vol. 60, pp. 377-396, 2015.